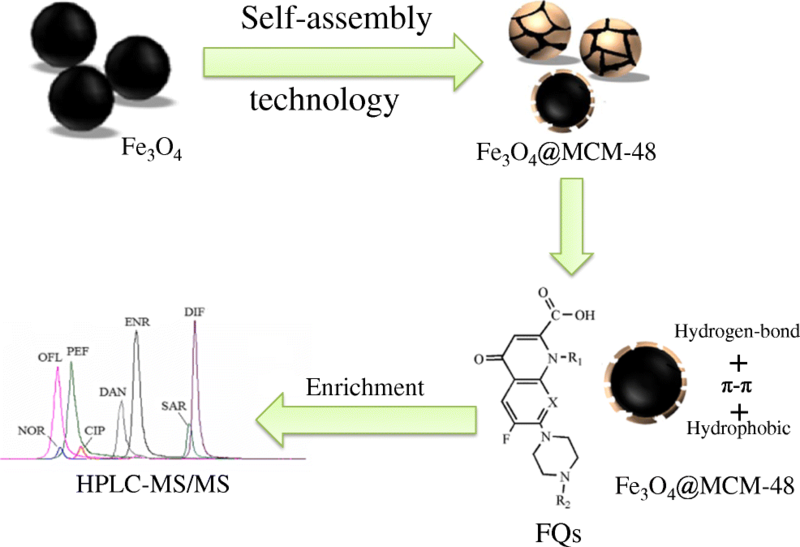 In this study, a magnetic molecular sieve material (Fe3O4@MCM-48) was synthesized by a combination of solvothermal and self-assembly methods. The physicochemical properties of the magnetic molecular sieve material were characterized by scanning electron microscopy, energy-dispersive spectroscopy, magnetic hysteresis loop measurements, transmission electron microscopy, powder X-ray diffraction, N2 adsorption–desorption analysis, and Fourier transform infrared spectroscopy. The as-synthesized nanocomposite showed various advantages, including easy magnetic-assisted separation, high specific surface area, and a highly interwoven and branched mesoporous structure. 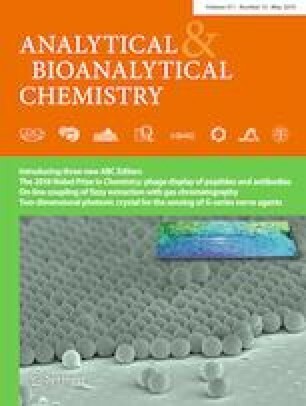 The Fe3O4@MCM-48 nanocomposite was then used as an effective adsorbent material for magnetic solid-phase extraction of fluoroquinolones (FQs) from water samples. The FQs in the extract were determined via liquid chromatography–tandem mass spectrometry. Adsorption and desorption factors that affected the extraction performance were systematically optimized using spiked purified water samples. Good linearity (with R2 > 0.99) was shown by this FQ detection system for FQ concentrations from 5 to 1000 ng L−1. Moreover, low detection limits (0.7–6.0 ng L−1) and quantitation limits (2.5–20.0 ng L−1) and satisfactory repeatability (relative standard deviation < 10%, n = 6) were achieved for water samples. The developed method was also validated for the analysis of FQs in meat and milk samples. Finally, FQs in food and drinking water samples were successfully determined using the developed method. The online version of this article ( https://doi.org/10.1007/s00216-019-01726-0) contains supplementary material, which is available to authorized users. Financial support from the Natural Science Foundation of Shandong Province (ZR2017MB011), the Research Grant Council of the Hong Kong Special Administrative Region (Research Grant Direct Allocation refs. 3132667 & 4053152), and the Key R&D Program of Shandong Province (2017CXGC0223) are gratefully acknowledged. The authors declare that they have no conflict of interest in regard to this work.